Easter Basket in a Bright Pink with a variegated colorful stripe from Mainely Handcrafts. 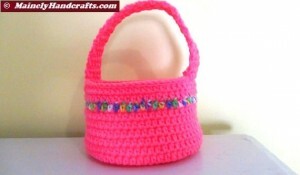 Crocheted with soft but sturdy Red Heart acrylic yarn. 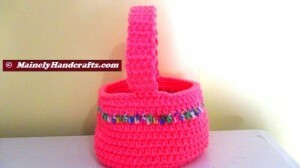 Makes a nice plant pot holder too (liner not included)! 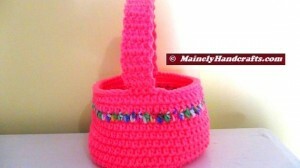 Handle folds in for easy storage. Can be machine washed and tumbled dry on low – reshaping may be necessary. 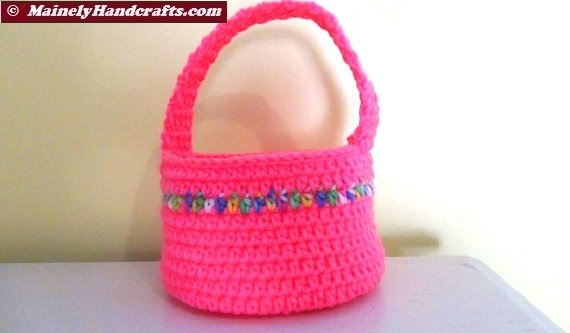 Crocheted Easter Basket – Bright Spring Basket – Green with variegated stripe. 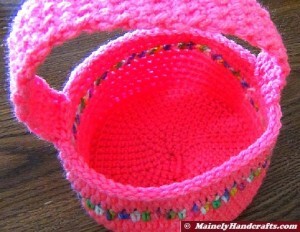 Easter Basket – Crochet Basket for Spring – Purple Basket. Four weeks (28 days) after being listed, this item was SOLD at Etsy.com, today, April 21, 2014 – the day after Easter!